The best way to see old town Santa Fe is on foot. That said, there are more than a few access obstacles in the historic heart of the city near the Plaza — an area that dates back some 400 years. On the other hand, with a little advance planning and careful route selection, it’s still possible to see the cultural highlights of this area with minimal walking. With that in mind, here’s a barrier-free Santa Fe walking — or rolling — tour, with stops at a number of accessible cultural attractions along the way. St. Francis Cathedral (www.cbsfa.org), which is just a block east of the Plaza, is a good place to begin an accessible Santa Fe walking tour. From the Plaza, go east on Palace Avenue, then turn south on Cathedral Place. St. Francis Cathedral is on the left — you can’t miss it. 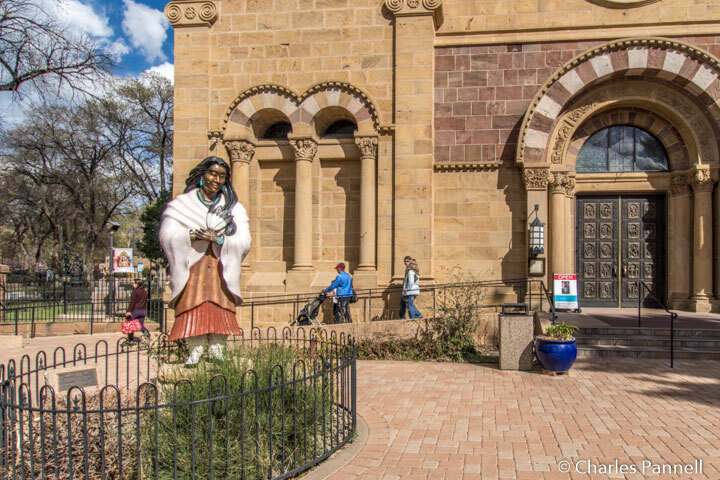 Built by Archbishop Jean Baptiste Lamy between 1869 and 1886, this Santa Fe landmark is the mother church of the Archdiocese of Santa Fe. And although there are steps up at the front of this Romanesque Revival building, there’s also ramp access on the left side. Inside, there’s barrier-free access throughout the church, with accessible seating in the chapel. The center aisle is lined with Corinthian columns, and accented with graceful arches. A massive baptismal fountain sits near the center of the church, and the intricately carved main altar is a sight to behold. Top it off with the stations of the cross, an impressive collection of historic paintings, and stained glass windows that were imported from France, and you have a truly magnificent sanctuary. The Museum of Contemporary Arts (iaia.edu/iaia-museum-of-contemporary-native-arts), which is located across the Street from St. Francis Cathedral, is often overlooked by visitors, but it’s truly a must-see on any Santa Fe visit. Although there are steps up to the entrance from Cathedral Place, there’s curb-cut access and a barrier-free pathway to that same entrance from San Francisco Street. Inside, there’s plenty of room to maneuver a wheelchair through the spacious galleries which display select works from a 7,500-object collection of contemporary native art. From paintings, textiles and cultural arts, to sculptures, ceramics and jewelry, there’s something for just about everyone. There’s also level access out to the first-floor courtyard which boasts an impressive collection of public art, and to the adjacent galleries which host a wide variety of rotating exhibits. And if you like what you see, dont forget to stop in at the well-stocked gift shop on the way out. 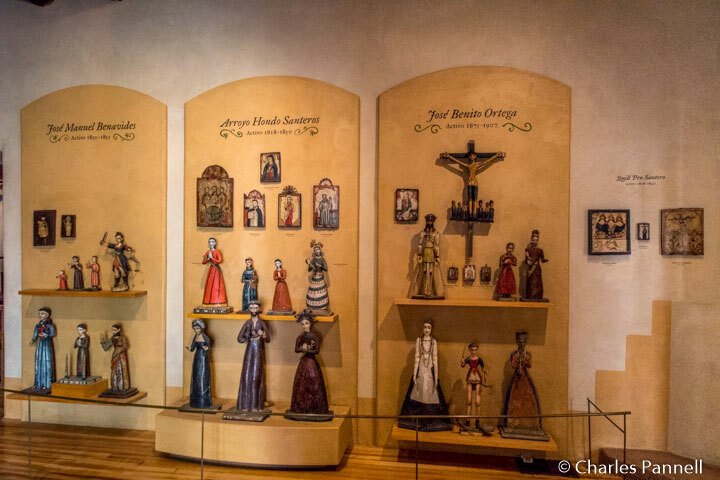 From the Museum of Contemporary Native Arts, head south on Cathedral Place and take a right on Water Street and a left on the Old Santa Fe Trail, to what many folks consider one of the most mysterious sights in town — the Loretto Chapel (www.lorettochapel.com). 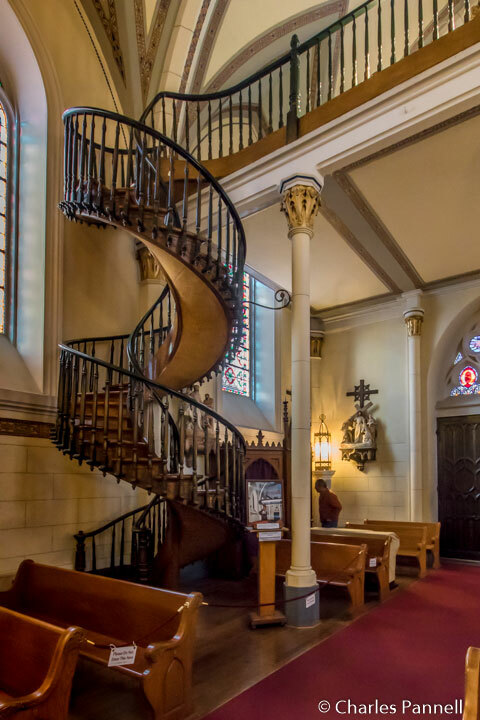 Known for a miraculous staircase to the choir loft, which lacks any visible means of support, the story behind it’s creation is just as mysterious. According to legend, the sisters of the chapel prayed to St Joseph — the patron saint of carpenters — for a way to access the then stair-less choir loft. Shortly thereafter an unknown carpenter appeared and constructed the spiral staircase, and left without payment. That was in 1878, and although a railing was added over the years for safety, the staircase remains as it was constructed — without any center or side support. There’s level access to this beautiful chapel, where visitors can also admire the stained glass windows, the stations of the cross and the Italian-made altar. There’s also an audio program that details the history of the chapel, and guests are invited to linger as long as they want. One of the highlights of old Santa Fe is the Palace of the Governors (www.palaceofthegovernors.org), which was constructed in the early 17th century as Spain’s seat of government over what’s now known as the American Southwest. Designated as a Registered National Historic Landmark in 1960, today this historic building houses part of the state’s history museum. As an added bonus, the stroll from the Loretto Chapel is very scenic. Just follow the Old Santa Fe Trail north past San Francisco Street, along the Plaza and over to the Palace of the Governors. Alternatively, you can cut through the Plaza; however even though the Plaza pathways are wide and level, there are some uneven brick sections that may be problematic for wheelchair-users. There’s level access to the front entrance of the Palace of Governors, which is usually lined with a gaggle of Native American vendors selling their wares. A wheelchair is available for loan at the front desk, and although there are ramps throughout this historic building, some manual wheelchair-users may require a bit of assistance on the steeper ones. That said, this building is not to be missed, as it’s a rare opportunity to get an inside look at adobe construction. Plexiglas panels have been placed throughout the building, so visitors can see the support structure and the original beams. The museum is filled with historic objects that have been unearthed by archaeologists, including pottery, utensils and weapons. And there’s also a good collection of items from the old west, including saddles, religious artifacts and even an old mail wagon. The exhibits span two floors, with elevator access to the second floor, and there’s always an interesting rotating exhibition or two in the mix. The New Mexico History Museum (www.nmhistorymuseum.org) is located just across the back courtyard from the Palace of the Governors. There’s level access to the museum, ramped access to all exhibits, and a loaner wheelchair available at the front desk. Best of all, admission to this museum is included with the entrance fee to the Palace of the Governors. 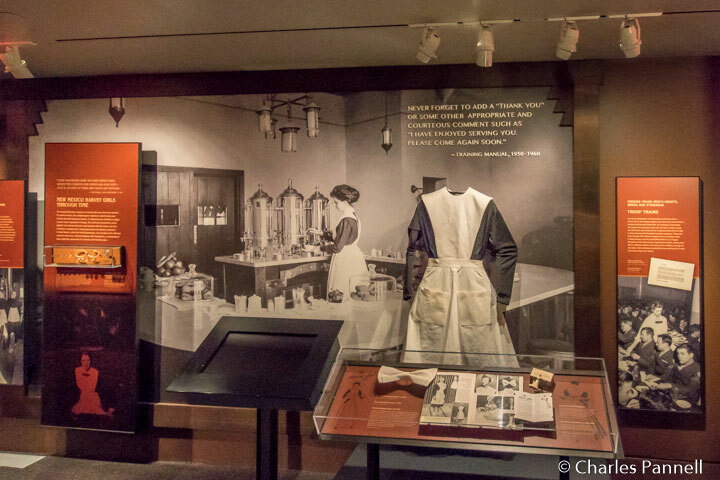 There’s plenty of room to maneuver a wheelchair through the exhibition spaces, which feature a variety of artifacts that chronicle the history of the state. 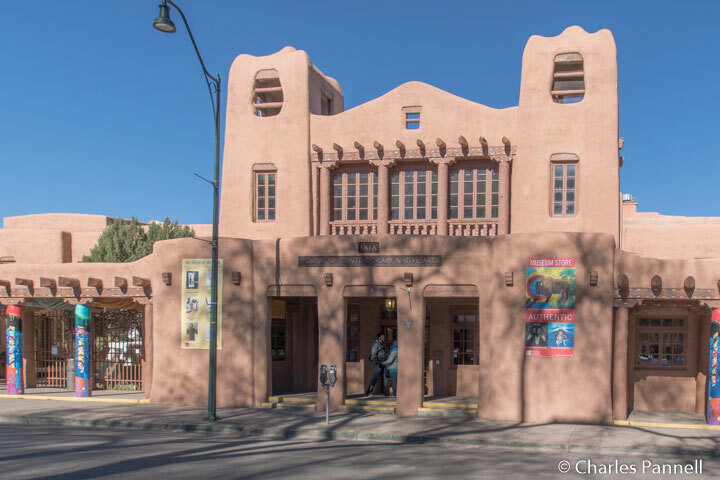 Starting with the early settlers and Coronado, and moving on to the Mew Mexico Missions, the Santa Fe Trail and even the Santa Fe Harvey House, the museum offers a comprehensive look at the history of the indigenous people, Spanish Colonization and early travel and commerce in New Mexico. And combined with the Palace of the Governors, this modern museum gives visitors a good overview of the colorful — and sometimes contentious — state history. The New Mexico Museum of Art (www.nmartmuseum.org), which is located just a block west of the Palace of the Governors, is also worth a stop. It’s just a short level roll down the street, and there’s curb-cut access to the wide level sidewalk along Palace Avenue, and level access over to the museum’s front entrance. There’s barrier-free access to all the galleries, and elevator access to the second floor. A scooter and a manual wheelchair are also available for loan at the front desk. This museum first opened in 1917, and many of the works that were exhibited on opening day are still part of the permanent collection. A good variety of rotating exhibitions are also presented throughout the year. And don’t miss the courtyard, which is dotted with murals by William Shuster. These frescoes, which were commissioned by the Federal Emergency Relief Agency in 1934, were created to honor the Pueblo Indians. It’s quite an impressive collection. The Georgia O’Keeffe Museum (www.okeeffemuseum.org) makes a fitting finale to any Santa Fe walking tour. From the New Mexico Museum of Art, continue west on Palace Avenue, take a right on Grant Street, and then turn left on Johnson Street. The Georgia O’Keeffe Museum is just a half-block up on the right. Although O’Keeffe was born in Wisconsin, she fell in love with New Mexico when she visited Santa Fe in 1917. By 1934 she was spending her summers at Ghost Ranch, about an hour north of Santa Fe; and in 1949 she took up permanent residence in the state. To say she was a local favorite is an understatement. 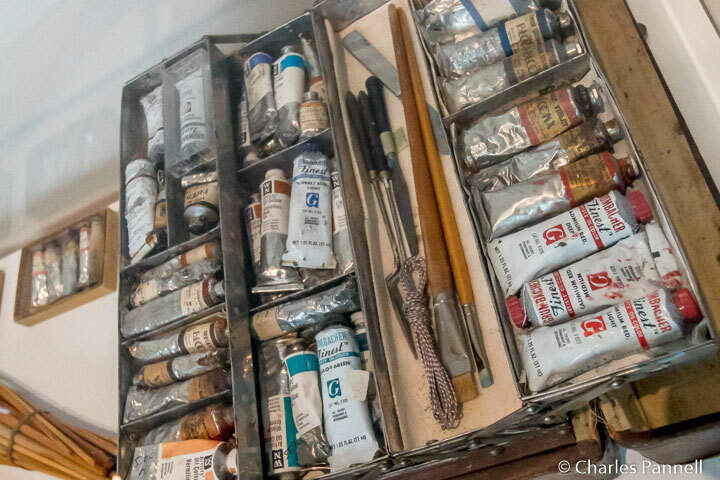 The museum was opened 11 years after her death in 1997, to honor her art and share it with the public. Today there’s excellent wheelchair access throughout the galleries in the adobe building, which is a work of art itself. The museum’s permanent collection consists of over 3,000 O’Keeffe works which span the length of her career, from 1915 to 1984. The galleries are divided by decade and the works include everything from paintings of her beloved New Mexico, and large scale depictions of flowers, leaves and other natural forms, to New York cityscapes. Don’t miss the collect of Todd Webb photographs, which offer a more personal look at the artist at her Ghost Ranch home. 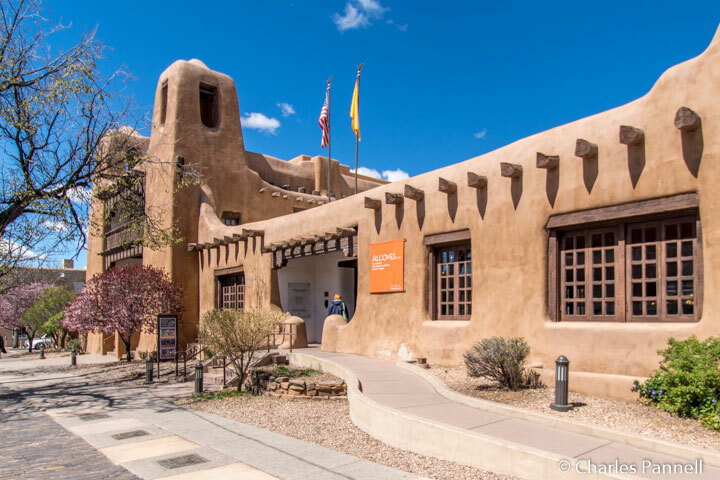 Add in some rotating exhibits and you have a truly spectacular museum — and reason enough to add Santa Fe to your cultural bucket list.